Holy crap, this is the most boring book ever written. Ok, in fairness to my 17-year-old self, I was most definitely not at an age where I could appreciate something like the “Hypnerotomachia”. Not to say that it’s chock-full of adult themes or anything like that, I just didn’t have the patience to deal with it. It tends to ramble. A lot. The narrator Poliphili (a name literally meaning “lover of many things”) has a tendency to drone on at length about pretty much everything he comes across from architecture to botany to fashion to everything! I put the book down and, although I carried it back and forth across half the country for almost a decade, didn’t pick it back up. Finally, in 2012, I decided I was tired of having this unfinished book staring at me from my bookshelves so I picked it up again and plowed through it. It was still a bit droning and rambling, but I definitely was much more interested now. And then I started looking into the book’s history. Having done a rather long episode about the “Hypnerotomachia” (it was an early effort, please forgive the video quality) I won’t rehash all of it. What I want to talk about in this post is a question I’ve had for some time and have recently come across pieces of an answer to. 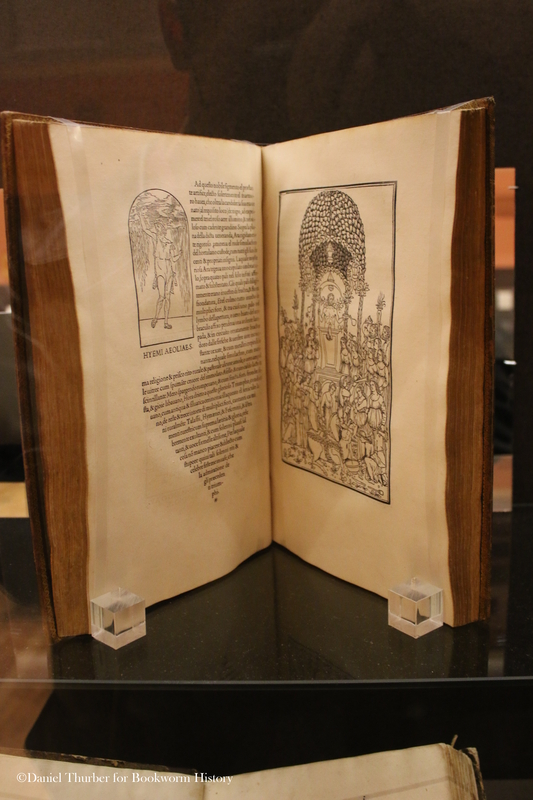 The “Hypnerotomachia Poliphili” was written by Francesco Colonna and first published in 1499 by the Aldine Press. Having read the book I became interested in the press. Founded and operated by Venetian humanist Aldus Manitius the press specialized in bringing humanist teachings to the masses, printing high quality books in the much more affordable and accessible octavo format. Aldus printed under the motto “Festina Lente”, a Roman idea meaning “to hasten slowly”. He used a dolphin entwined around an anchor to represent this idea. The question I’ve long been wondering about is this: Aldus first used the dolphin and anchor as his printer’s mark in 1502, in the second volume of the “Poetae Christiani”. So why does the design appear in a woodcut in the “Hypnerotomachia” in 1499? So how did the image end up in the “Hypnerotomachia”? Was it coincidence? Was it a sly way of Aldus signing his work? The “Hypnerotomachia”, a definite contender for the most beautiful book ever published, was a very, VERY pagan work to which Aldus, being a humanist tutor with ties to the church, didn’t actually put any publisher’s information in. The only indication that his press produced the work is that his name is on a page of errata at the end. The version that appears in the “Hypnerotomachia” woodcut resembles what Aldus would later use as his mark, but it’s not exact. The most noticeable difference is that while the anchor in the printer’s mark is vertical, the one in the woodcut is horizontal. In the English translation, Poliphili says that he interprets this symbol to mean “always hasten slowly”. This would all seem to fit perfectly with what we know. Aldus had definitely used this motto three years before he would start using this motto! While the original text might still translate as “make haste slowly” that doesn’t necessarily mean that those are the words Colonna actually wrote. One of my favorite files on my computer (insert “nerd” comments here) is a facsimile copy of an original “Hypnerotomachia”. It was here I started looking. Turns out that while “make haste slowly” is certainly an accurate translation, the original text does not feature the words “festina lente”. The original says “festina tarde”. It may seem a small distinction, essentially meaning the same thing (“lente” translates as “slowly” while “tarde” means “late”). But it also means that Aldus did not lift his motto from the Hypnerotomachia and, while he was familiar with the image at that time, it seems unlikely he, as publisher, inserted his own symbol and text into another author’s work. 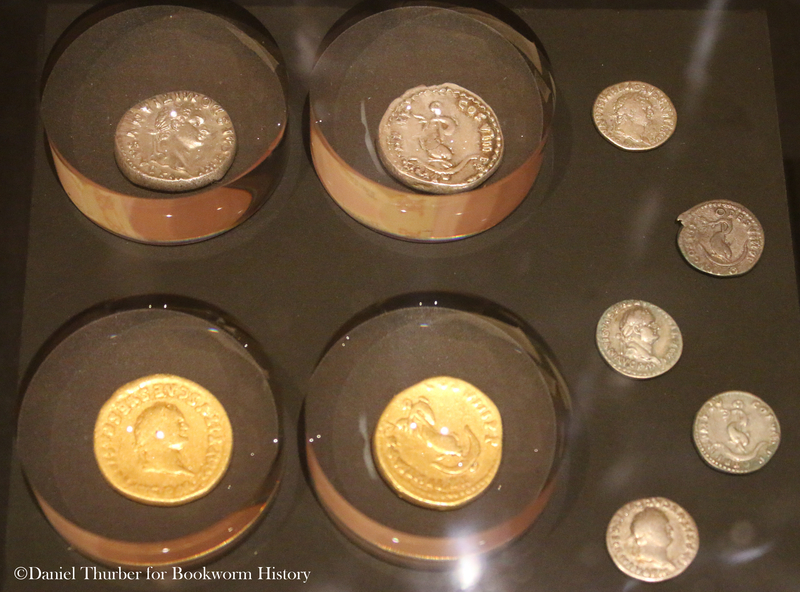 According to Erasmus, writing in 1508, Pietro Bembo showed Aldus a denarius with the dolphin and anchor on it. 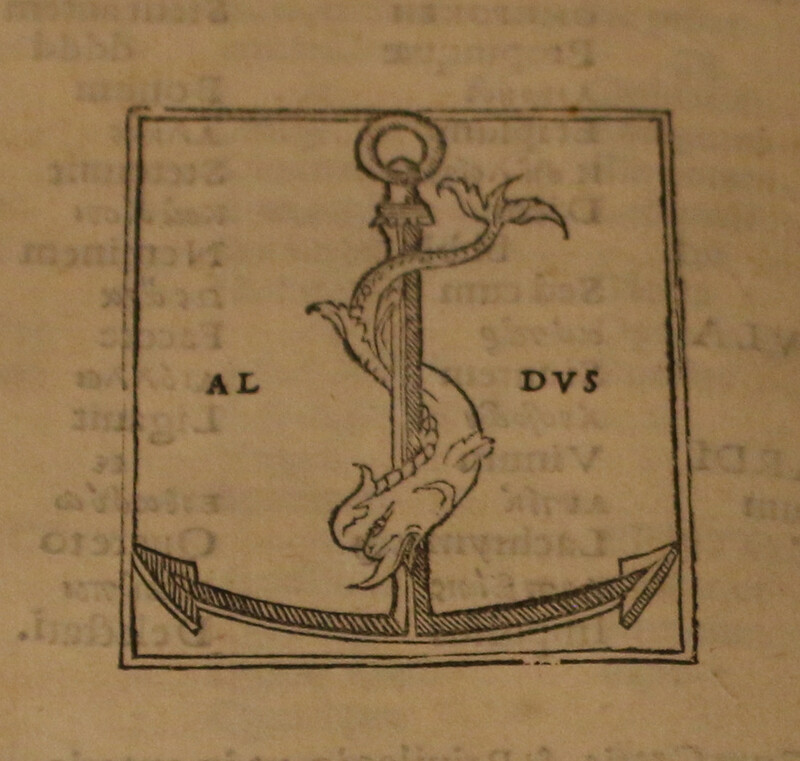 Aldus told Alberto Pio in 1499 that he was keeping the dolphin and anchor as his constant companions. While none of this is conclusive enough to definitively state that Aldus was working out his famous printer’s mark prior to the printing of the “Hypnerotomachia” it all does seem to suggest that it was a familiar symbol to humanists of the age and is not surprising that it should appear multiple times. This post was motivated (aside from my own interest) by a recent exhibit on the Aldine Press at the Grolier Club in New York City, which is where the pictures came from. Despite having been fascinated by the “Hypnerotomachia” for several years I had never actually seen an original copy. It was very exciting to see a real copy “in the flesh”, as it were. For more information on the Aldine Press check out this article from an exhibition at the Morgan Library in 1995. A great biography of Aldus is “Aldus and his Dream Book” written by Helen Barolini. The text is even formatted like the “Hypnerotomachia” and features all the original woodcuts. For a complete facsimile copy of the “Hypnerotomachia” click here (even if you don’t read the odd Italian-Latinate that it was written in, it’s worth perusing just for the woodcuts and beautiful formatting).